The community-based maternal and neonatal care (CB-MNC) program of the Nepal Family Health Project (NFHP) was designed to address key health needs of mothers and newborns in Nepal who live in rural locations and have limited or no contact with facility-based health services. 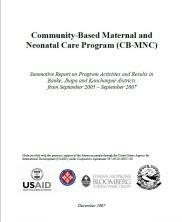 This document presents the summary details of a comprehensive monitoring and evaluation effort conducted with assistance from Johns Hopkins University through the NFHP. The studies found a significant increase in skilled birth attendance and dramatic declines in maternal and neonatal mortality. Nepal Family Health Program/JHU/John Snow, Inc., December 2007.